A few days ago for dinner we ate a spicy southwest bulgur salad, made with diced tomatoes, red onions, orange peppers, and cilantro then tossed with a roasted poblano and lime vinegarette. T: Labor day’s over. Fall is upon us. I guess I’m ok with that. A: doesn’t labor day just signify when fashion moves from summer to fall? not the real world? i though we still had a few weeks until it was technically fall. T: it’s that time of year, though. The weather is creeping towards cooler temperatures. I’ve always liked the fall. It brings about some kind of odd emotional stimulation that I can’t explain, but I know a lot of other people feel it too. A: true dat. i definately feel it, although i haven’t really begun to feel fall yet, here in san diego. I asked a co-worker yesterday when it started to cool off here, to which he responded, “some time between october and january.” then it’s only supposed to stay cool for a few weeks. T: and that’s a good thing. cool=good, cold=evil. Unless we’re talking about an ice-cold bud light like I have in front of me right now. that’s not evil. some would claim otherwise, but I’m a fan. A: heheheh, i definately don’t think that ice cold beer is evil… but i am mega-jealous that you get to drink one, when my day is just getting started. It’s nothing but strong coffee for me. T: mmm… strong coffee is good too. Another wonderful evil. So, if you could, remind me of what was in this bulgur salad (since we ate it before our friends came into town for labor day). A: hmm… lets see. it was made with bulgur wheat, orange peppers, red onions, tomatoes, cilantro, and a roasted poblano pepper & lime vinegarette. quite tasty in my opinion. i love these grainular salads. T: mmmm I do to. So fresh and healthy. uhh, is grainular a word? T: yes ma’am, mrs mandy! 😛 As far as grainular salads go, this one was a 4.4/5. It was super. As far as grains go, bulgar is pretty good. I think quinoa might be my fave, though. A: i can understand that. quinoa is more tender and has a different flavor all-together. did you know that bulgar wheat is actually a ground up, parboiled then dried version of whole wheat? it’s actually one of the healthiest ways to eat whole wheat. it’s got tons of fiber, B vitamins, and folates. but don’t be dissuaded by the health-factor, it tastes good too. I give this salad a 4.34/5. It was kind of like tabbouleh, only not – thus why i called it a bulgur salad. i enjoyed it so much i ate the huge bowl of leftovers for lunch the next day. T: i feel like we’ve had this conversation before, but… is bulgur what they use to make sugar smacks? A: hehehe no silly, we had this conversation before about barley, not bulgar. they definately don’t make sugar smacks out of bulgar. that much i’m sure of. T: why is bulgur so hard to spell? Are you sure it’s spelled with 2 u’s instead of a u and an a? I can’t get a grip on this. A: yup. i’m positive. b u l g u r. bulgur. Yes!!! i got it right this time. bulgur bulgur bulgur. do i win the spelling bee? T: yes. but, how do you spell “get me some smacks, woman”? Place the bulgar wheat and 1 tbsp olive oil into a heatproof boil and stir to coat the bulgar with the oil. Pour the boiling water over the bulgar wheat and cover tightly with plastic wrap. Set aside for 15 minutes then fluff with a fork. While you're waiting, make the vinegarette. Add the garlic and lime zest into a blender or food processor. Process until the zest and garlic are finely chopped. Add the roasted poblano peppers, lime juice, water, cumin, and cayenne and blend the mixture again, thouroughly. Once the poblano-lime mixture is pretty smooth, start to slowly drizzle in the olive oil to emulsify the vinegarette. When finished taste the vinegarette for seasoning and add salt and pepper to taste. Once the bulgar is finished and fluffed, add the tomatoes, red onion, orange pepper and cilantro, and vinegarette to the bowl. Mix all the ingredients together thoroughly. Let the salad sit, refrigerated for at least half an hour, then taste the salad and adjust the seasoning as necessary (with salt and pepper, of course!). The salad is great served chilled or at a room temperature, making it perfect for picnics or any occasion. Enjoy! what? no talk of politics? Thanks, The artist! your work is lovely as well. Adam, we didn’t even think we were talking politics in the post that got all those peoples feathers ruffled! i swear, i love children!. Hey thanks for coming by. The cemetary is in Arnprior Ontario, which is located where the Ottawa River meets the Matawaska River. It was a huge fur trade route and the beginning of the new settlements by the pioneers. You can find it on a map of Ontario. Yum. Yum. Yum. Yum. Yum. Delicioso! So pretty! Looks delicious and good for us. Lovely recipe! I do like bulgur though I was used eating it plainly with cocoa. It’s more like a chocolate porridge! this dish looks so yummy and refreshing for these hot days ! I’m afraid of grainular salads! 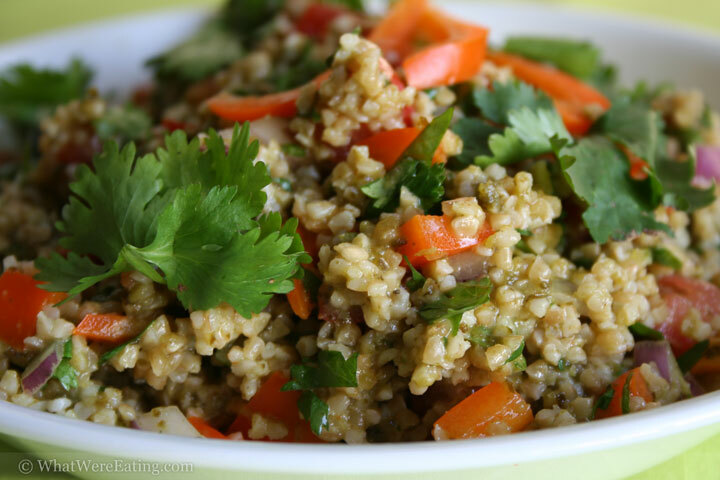 Bulgur, quinoa, spelt…super scary! But this does look quite tasty. I’d try some if YOU made it! Marianne, I hope it turned out great! i just love bulgar. Lynn, thanks for the info, it looks like such a gorgeous area. Bulgur porridge!!! Why charles, I’ve never heard of such a delightful idea before. I’ve never eaten any kind of sweet dish with bulgur! … and thank you for your compliments! kitchen mama, i totally agree! i’ve been so uninspired to slave away over the hot stove lately. dishes like these are perfect. Thanks Michelle, you will soon. Although, maybe first we will bad-for-us food out and about in san diego first. look out for an email, i’m gonna fire one off to you in the next day or two. Mr. Wesley! look at you leaving comments on the blog! how exciting, one of our only real life friends to ever comment. (excluding the magnificent mme H, of course)….and BTW, it’s a salad made with grains so i perfer “grain-ular”, to “granular”! please come back and chat when ever! That’s crazy… in the usa, i don’t think we were ever served anything as healthy as bulgur for a school lunch meal. I’m definitely going to make this. I can never think of enough creative ways to eat bulgur.